There is a new nutrition book for cancer patients – written by Jean LaMantia, a Registered Dietitian, cancer survivor and frequent Wellspring leader and NOURISH program developer in Toronto. 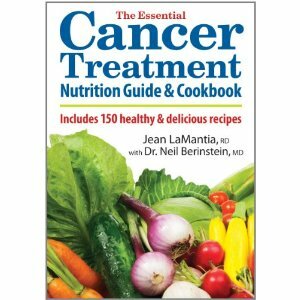 ‘The Essential Cancer Treatment Nutrition Guide and Cookbook’ by LaMantia (Robert Rose Press) was recently published and has a wealth of helpful information for patients who are experiencing treatment-related side effects and are seeking information on how to stay well or those post treatment and eager to regain their health. The book includes helpful information, practical suggestions, and recipes to manage the side effects that patients often experience, such as fatigue, nausea, weight loss, food aversions and loss of appetite. What really makes this book come alive is “Survivor Wisdom” – insights and quotes from people who have gone through this cancer journey and share their personal experiences and suggestions. If you are in treatment, post treatment, or have a loved one living with cancer, this book is an essential tool for staying well. The recipes are simple and healthy and will benefit both the cancer patient and other family members. Jean is coming to Wellspring Westerkirk House to launch her book on Wednesday May 9th from 1-3pm. Jean will read from her book and guests can purchase a book ($20 cash) and have Jean sign it. To register for this event, please contact Westerkirk House at 416-480-4440. I hope that the author will consider going to more than just the Toronto location of Wellspring. There is more to Canada than Toronto, and those suffering from cancer in other parts of the province would like to benefit from her knowledge and expertise. Hi Susan. We would love to send Jean all over the country! Hopefully she will be in London later this year and we will post details of her upcoming talks. IS this book available in online for sale? I hope this book helpful to cancer patients to what to eat and what to avoid. Hi there – I’m just checking into this and will let you know! AmericanHealthJournal is looking for partnerships with blog owners in the medical genre. AmericanHealthJournal is a medicine content site containing three thousand of high quality health care videos. We are in need of professionals to contribute content to our brand. Contact us at our contact page on our web site. I was referred to this book by a neighbour and fellow cancer survivor. I got it out of the library, and I LOVE the recipes and information in it. Hoping to attend a session with her soon. perhaps twitter posts through others (earned). which came in the form of the next blues-only venue, Antone’s, founded by the late Clifford Antone, during the summer of 1975. Wellspring is a network of centres that helps people cope with cancer. Programs provide support, education, rehabilitation and coping skills, free of charge.